USS DETROIT was the fourth and last ship of the Navy’s first class of Fast Combat Support Ships. Last homeported in Earle, NJ, the DETROIT was decommissioned on February 17, 2005, and was subsequently laid-up in Philadelphia, Penn. The DETROIT was sold for scrapping in September 2005 to ESCO Marine Inc., Brownsville, Tx. Scrapping was completed on November 3, 2006. This section contains the names of sailors who served aboard USS DETROIT. It is no official listing but contains the names of sailors who submitted their information. Click here to see which USS DETROIT memorabilia are currently for sale on ebay. USS DETROIT collided with a Navy oiler off the South Carolina coast suffering minor damage. An explosion rips through the stack of USS DETROIT's after engine room causing much material damage while the ship is in Newport, Rhode Island, for repairs and upkeep. June 10, 1981 Hampton Roads, Va.
USS DETROIT runs aground on a sandbar near Old Point Comfort, Hampton Roads, Va., as the ship is preparing to enter port at Norfolk. There are no injuries or apparent damage. The DETROIT is refloated the next day after off-loading its fuel. USS DETROIT suffers a Class Bravo fire in the 1A1 Forced Draft Blower while moored at Souda Bay. Several crew members are treated for smoke inhalation. January 30, 1989 Norfolk Naval Station, Va.
A sailor is scalded to death when steam is accidentally sent into a boiler he was sent to clean. The ship is docked at the Norfolk Naval Station at the time of the accident. August 27, 2000 100 miles east of Norfolk, Va.
USS DETROIT collided with the destroyer USS NICHOLSON (DD 982) early Sunday night during a refueling maneuver. The destroyer sustained light damage on the port side of its helicopter hangar about 8:45 p.m. when it bumped the starboard side of the USS DETROIT, officials said. Damage to the DETROIT was negligible, they said. A handful of sailors from the NICHOLSON suffered minor injuries, the Navy reported: an injured ankle, possible shock, an elbow injury, possible torn knee ligaments, and a head cut that required stitches. In the incident, the NICHOLSON and the DETROIT were steaming alongside each other, as is customary during a replenishment at sea. While the maneuver was described as a training session for the crews of both ships, it also involved an actual fuel transfer. No cause for the accident has been released. The weather was not a significant factor. The weather there was good at the time of the mishap, with seas 2 to 4 feet, light southeast winds and unlimited visibility. 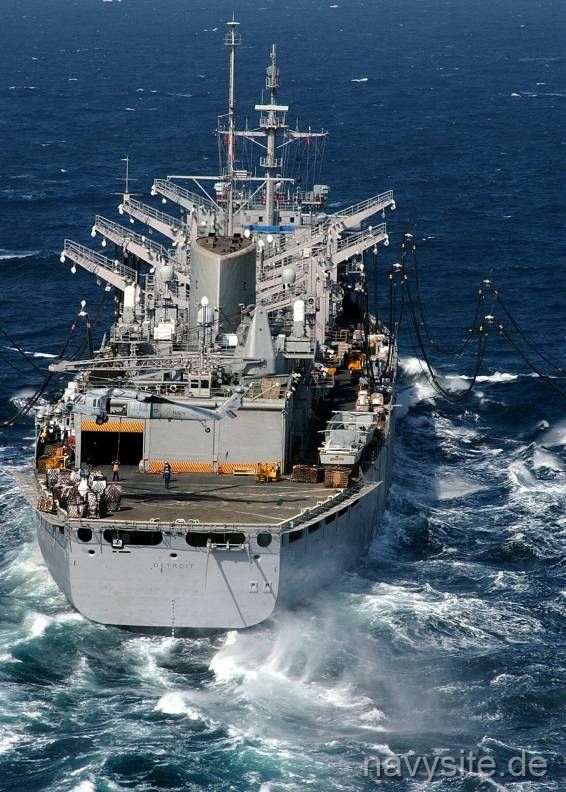 Normally, during an at-sea refueling there is a separation of 90 to 180 feet between the two ships. A refueling ship such as the DETROIT generally maintains a set course and speed while the ship being refueled approaches it from astern, then matches the refueling ship's course and speed. Fuel lines are then transferred to begin the refueling. After a similar collision with two other Navy ships just two month before some experts warned of a phenomenon called the "Venturi Effect," in which a powerful suction is created near the stern area of one ship that can pull in an overtaking vessel at close quarters, causing a collision. After the collission the DETROIT was able to finish her mission and on September 1, she returned to Earle, NJ. USS DETROIT was built at Puget Sound Naval Shipyard, Bremerton, Washington. She was commissioned 28 March 1970. After her initial shakedown cruise, DETROIT departed Bremerton for her first operational home port, Newport, Rhode Island, rounding the Horn of South America en route. Shortly thereafter, DETROIT deployed for six months of extended operations with the U.S. SIXTH Fleet, returning to Newport in December 1971. DETROIT again deployed to the Mediterranean on 1 December 1972, returning to Newport in July of the following year. A shore establishment realignment led to DETROIT’s home port shift to Norfolk, Virginia in January 1974. DETROIT sailed from Norfolk 14 July 1974, en route to her third Mediterranean deployment in support of SIXTH Fleet operations. In addition to her normal taskings, she participated in contingency operations related to the Cyprus crisis, completing this task in December 1974 before returning to Norfolk. DETROIT sailed for her fourth Mediterranean deployment on 19 August 1975 and completed over 200 replenishments before returning to Norfolk on 28 January 1976. On 13 July 1976, DETROIT sailed north to commence her first shipyard overhaul at Bath Iron Works in Maine. The NATO Sea Sparrow Missile System and new communications capabilities were added prior to her return to Norfolk in July 1977. DETROIT’s fifth Mediterranean deployment was completed on 26 October 1978. Through 232 replenishments, her motto was proven true - "SUPERARE OPTIMUM" (To Surpass the Finest). After another five-month Mediterranean deployment in 1979, DETROIT returned to Norfolk for a short six-month turn-around in preparation for her seventh Mediterranean deployment, commencing on 14 July 1980. A Suez Canal transit followed National Week exercises, and the new routine became the support of SEVENTH Fleet’s Indian Ocean Battle Group operating in the vicinity of the Arabian Gulf. Returning through the Suez, DETROIT proceeded to service SIXTH Fleet units prior to visiting Lisbon, Portugal, in late November. DETROIT returned to Norfolk on 11 December 1980. DETROIT departed Norfolk on 25 June 1981 for her eighth Mediterranean deployment. She serviced SIXTH Fleet and NATO units and participated in the missile exercises in the Gulf of Sidra, when two Libyan aircraft were shot down by F-14 Tomcats from USS NIMITZ (CVN 68). DETROIT returned to Norfolk on 8 November 1981. In January 1982, DETROIT began her second shipyard overhaul at NORSHIPCO’s Berkeley Yard in Chesapeake, Virginia. The focus of this overhaul was in the engineering plant and the crew’s living quarters. Her defensive capability was also upgraded by the addition of two Vulcan-Phalanx Close-In Weapons Systems (CIWS). DETROIT left NORSHIPCO in January 1983. 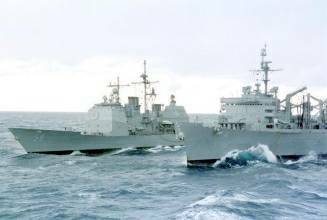 On 20 October 1983, DETROIT departed for deployment with the SIXTH Fleet. While in the Mediterranean, DETROIT was the principal Combat Logistics Force ship supporting U.S. and Allied units of the Multi-National Peacekeeping Force, in Beirut, Lebanon. 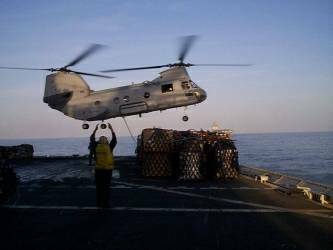 Throughout the height of the crisis, DETROIT provided logistical support to two carrier battle groups, the NEW JERSEY (BB 62) Battle Group and the deployed Marine Amphibious Ready Group. 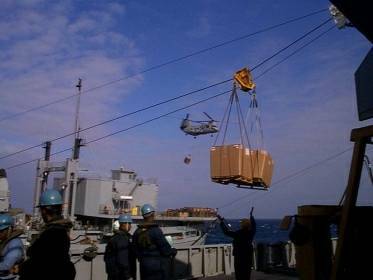 When she returned to Norfolk on 2 May 1984, DETROIT had completed 301 replenishments, a new ship’s record. In February 1985, DETROIT completed an extensive three-month repair availability. From July through October 1985, she participated in fleet exercises in the Caribbean, as well as in Ocean Safari 85 operating above the Arctic circle in Norway’s Vestfjord. In August 1985, DETROIT successfully completed the first Operational Propulsion Plant Examination given to an AOE by the CINCLANTFLT Propulsion Examination Board. In March 1986, DETROIT departed Norfolk for her tenth deployment with the SIXTH Fleet in the Mediterranean. 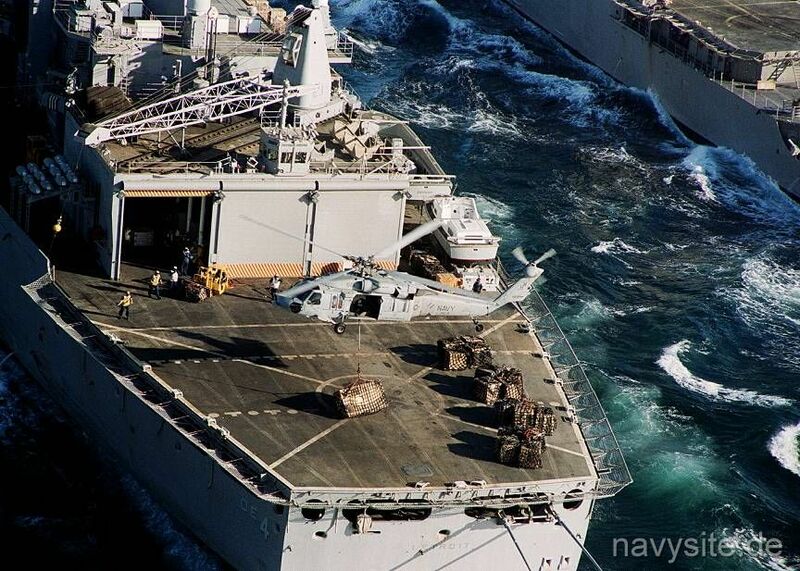 She supported in three carrier operations off the coast of Libya in March and April 1986. In September 1986, she returned to Norfolk. The summer of 1988 found DETROIT back in the European theater, participating in Exercise Teamwork 88 replenishing U.S. and NATO allies in the Norwegian fjords. After officially changing homeports in October 1989, DETROIT was underway in support of law enforcement operations in the Caribbean Sea. In May 1990, DETROIT arrived at Naval Weapons Station Earle, Leonardo, New Jersey where she is currently homeported. 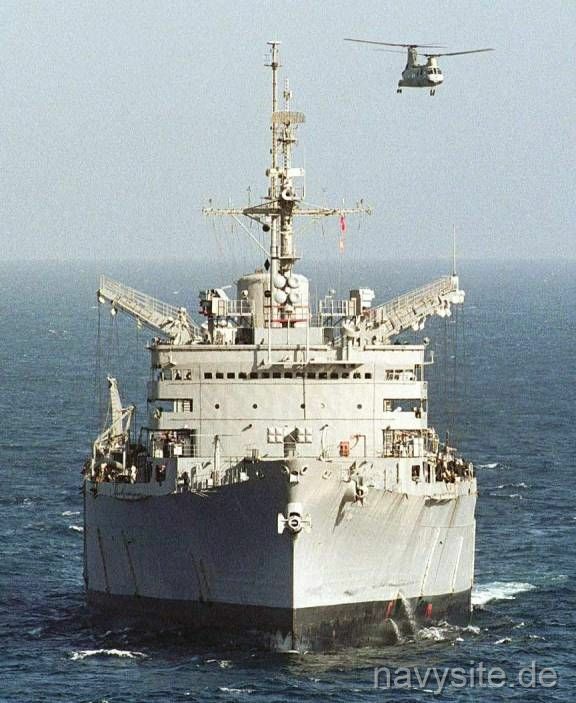 In August 1990, DETROIT deployed to the Mediterranean for the 11th time since commissioning, but was diverted to the Red Sea in response to Iraq’s invasion of Kuwait. She remained on station in the Red Sea through the remainder of the year. 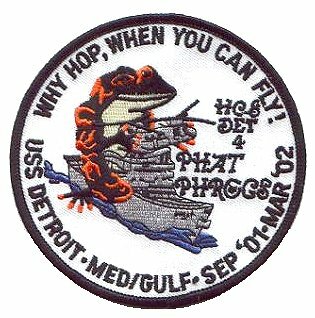 On January 17, 1991, Operation Desert Storm commenced with DETROIT as one of two Fast Combat Support ships on station. DETROIT’s crew worked non-stop for the remaining three months of what ultimately became a nine-month deployment. DETROIT commenced a six-month dry docked phased maintenance availability in May 1991 at Philadelphia Naval Shipyard. 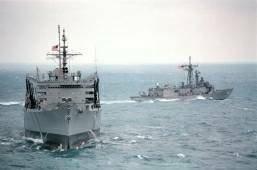 In May 1992, DETROIT returned to SIXTH Fleet In support of MED 2-92. This deployment proved to be remarkably successful for DETROIT and her crew. DETROIT participated in the insertion and retrieval of US Army and Navy Special Forces during the Exercise Ellipse Bravo, and rescue efforts to the TCG MAUVENET, a Turkish warship, after it was struck by a missile. DETROIT returned to Philadelphia Naval Shipyard for a dry-docked phased maintenance availability in July 1993. Shipyard repairs were completed in January 1994 and the ship immediately commenced work-ups for her next deployment. On October 20, 1994, DETROIT was underway for her 13th Mediterranean deployment. Prior to arriving in the Mediterranean, the ship was tasked to take station in the Arabian Sea in support of US Naval Forces. DETROIT returned to the SIXTH Fleet in December 1994. She remained in the Mediterranean and Adriatic Seas, providing logistics support for the remainder of the deployment. 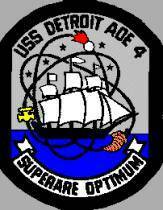 On November 22, 1996, DETROIT deployed with the THEODORE ROOSEVELT Battle Group for her 14th Mediterranean deployment. DETROIT performed operations in the Adriatic Sea, as well as transiting the Suez Canal, joining the FIFTH Fleet in support of Operation Southern Watch. Additionally, she participated in exercise Inspired Siren 2-97 and a variety of other multi-national exercises. DETROIT returned to Earle, NJ on 22 May 1997. From July through November 1997, DETROIT underwent a four month phased maintenance availability, which extended the life of her propulsion plant at least another ten years. DETROIT earned the Commander, Naval Surface Force, U. S. Atlantic Fleet 1997 Battle Efficiency Award and the 1997 Chief of Naval Operations Ship-Helo Safety Award. DETROIT recently completed the basic phase of training in preparation for her next deployment in support of the ENTERPRISE Battle Group. 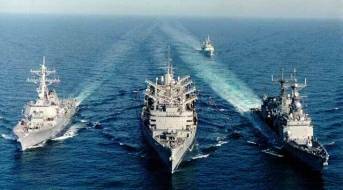 In June 1998, DETROIT participated in the Maritime Exercise "Unified Spirit" where she provide Combat Logisitic Services for several NATO ships, as well as other U. S. Navy Units. 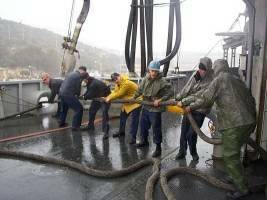 During the eleven day exercise, she UNREPed 35 separate units and pumped nearly two million gallons of petroleum products in 52 alongside periods. Immediately following the exercise, she was dispatched to Mid-Atlantic for a two day download of the USS SANTA BARBARA prior to her decommissioning later in the year. Additionally, DETROIT provided several UNREPS for units of COMDESRON 22 as they transited the Atlantic on their way home from deployment. Upon DETROIT’s return to Earle, NJ on 2 July 1998, Captain Mark McNally relieved Captain William J. McCarthy as Commanding Officer, becoming the twenty-second Commanding Officer of the mighty warship DETROIT. Captain M. H. Kaczmarek, Commander, Combat Logistics Group Two was the guest speaker. Captain William J. McCarthy, the outgoing Commanding Officer, was presented the Legion of Merit Award for his truly outstanding leadership while Commanding Officer of DETROIT. In November 1998, she departed on her next deployment in support of the USS ENTERPRISE Battle Group. 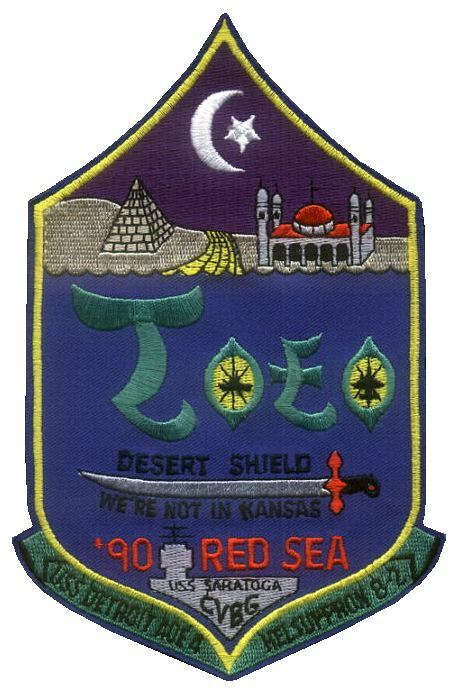 During this deployment the Battle Group conducted Operation Desert Fox against Iraq. In June 1999, DETROIT was home in Earle.